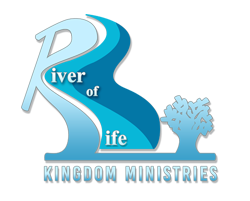 River of Life Kingdom Ministries! We are a Spirit-filled, Spirit-led ministry that has been mandated to teach the infallible, unequivocal Word of God with clarity and in a way that empowers you to live a successful, peaceful, and victorious life. We are a diverse community of believers who are fervent in our praise and unashamedly worshippers. You've been directed to this site by divine providence and purpose. We are confident that you will experience the love, presence and power of Jesus as you flow with us at The River. So come on in, the water's great! Every month at The River, there are fresh and exciting Kingdom teachings offered to enhance your relationship with God. Take a look and come on out! To glorify God as we serve, aid, educate and motivate adults and children in ways that strengthen and preserve families, promote personal responsibility, and foster independence. The Ministry teaches life application of the Gospel through regularly scheduled services on Sunday mornings and Thursday evenings. Listen to The River's weekly broadcast Sunday Sermons.